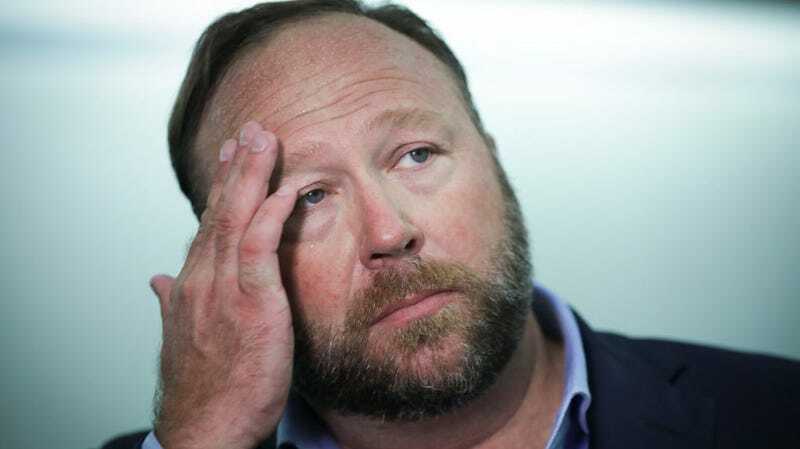 Just when we thought Twitter was going to be the last one to hold the toxic bag that is Alex Jones, payment processing giant PayPal reminded the internet today that, yup, it was still helping Infowars make money, and that also it’s very sorry and plans to stop. Better late than never! “We undertook an extensive review of the Infowars sites, and found instances that promoted hate or discriminatory intolerance against certain communities and religions, which run counter to our core value of inclusion,” a PayPal spokesperson told Gizmodo, while declining to answer a question about why the company had only reached this decision now, years into Jones’s consistently vile schtick. The ongoing relationship between PayPal and Infowars was reexamined last month by Right Wing Watch’s Jared Holt. PayPal confirmed it would cease providing services to Infowars, as well as affiliated sites (of which it only referred to editor-at-large Paul Joseph Watson’s site, Prison Planet, by name.) It’s unclear where Jones could turn next, given that competing payment processor Square also has clauses in their terms of service prohibiting the uploading of “defamatory, libelous, threatening, harassing, hateful, abusive, or inflammatory” material. The PayPal ban caps off a string of deplatforming efforts against Jones that have included removals from Facebook, YouTube, Spotify, and Linkedin, among others. These bans have effectively kneecapped Infowars’s traffic and viewership.